During March 2006, an excavation was conducted in the village of Nein (Permit No. A-4691; map ref. 23297–300/72622–5), prior to construction. The excavation, undertaken on behalf of the Israel Antiquities Authority and underwritten by the contractor, was directed by A. Mokary (field photography), with the assistance of A. Hajian (surveying) and laborers from Umm el-Fahm. The village of Nein is located at the northern foot of Giv‘at Ha-More, c. 1 km east of ‘Afula ‘Illit. Numerous excavations and surveys had been conducted in the village, yielding settlement remains from the Late Bronze Age (HA-ESI 121; HA-ESI 122; Permit Nos. A-5466, A-5500), the Iron Age (ESI 16:58), and the Roman through the Ottoman periods (ESI 16:58; 20:28*–29*; HA-ESI 114:110*–111*; HA-ESI 118; HA-ESI 120; HA-ESI 121; HA-ESI 121; HA-ESI 122; Permit No. A-4207). Following the removal of surface level (thickness 0.4 m) with the aid of mechanical equipment, a single excavation area (4×7 m; Fig 1) was opened. The excavation had reached bedrock and at least two strata were revealed: remains of a single building phase, founded on bedrock, survived in a layer ascribed to the Early Islamic period (Stratum II) and the layer dating to the Mamluk period (Stratum I) consisted of two distinct building phases, and possibly a third one, of which one wall had survived, although it could have belonged to a later period of occupation. The antiquities ascribed to Stratum II include a room and a section of another one that together formed part of a building, generally aligned east–west and founded on bedrock. Four walls of the building (W25–W27, W30), preserved two–three courses high, were built of partially worked limestone; the bottom courses of another wall (W19) also consisted of partially worked limestone. The eastern room was probably paved with stone, but only a small section of the pavement (L23) survived next to W25. The pavement was damaged by a refuse pit that was dug in the Mamluk period (L24; Stratum Ib) and had penetrated into the room down to bedrock depth. A floor of pounded limestone (L22) survived in the western room and smashed sections of it abutted W19. Fragments of pottery vessels above the floors of the two rooms dated to the Early Islamic period (seventh–eighth centuries CE). Three construction phases were ascribed to Stratum I. The remains from the earliest construction phase (Ic) were fragmentary and included an installation (L31), surrounded by a wall (W20); a wall (W29) that abutted W19, which continued to exist in this phase and a floor (L18) in the western part of the excavation area; a short section of a wall (W28), built of two rows of worked stones, was exposed in the eastern part of the excavation area. Installation 31 was probably circular and paved with small fieldstones. Wall 20 was built of small fieldstones, preserved five courses high and ashlars that survived two courses high. It is difficult to determine the use of the installation as only about a quarter of its size was revealed, as well as the function of the ashlars construction. Wall 29, founded on Floor 22, was built haphazardly of medium-sized limestone and preserved a single course high. Floor 18, composed of tamped earth mixed with crushed chalk, abutted W29 and was overlain with fragments of glazed bowls, kraters with geometric drawings, jars and lamps, as well as basalt pounding vessels, all dating to the fourteenth century CE. The remains of this phase were found covered with a thick layer of soil fill (0.7 m) that contained a large amount of ash and a ceramic assemblage from the Mamluk period, similar to that on Floor 18. The remains of the second construction phase in Stratum I (Ib) were founded on top of the fill. A floor of crushed chalk and flat paving stones (L13) abutted two walls (W11, W15), built of a single row of roughly hewn limestone. A tamped earth floor (L14), with a tabun (L17) installed above it, extended west of W11 and abutted W19, which was raised in this phase. Both floors were overlain with fragments of glazed bowls, cooking pots and jars, and one coin, all dating to the Late Mamluk period (fourteenth–fifteenth centuries CE). Also attributed to this phase is a refuse pit (L24) that was dug in the southeastern part of the excavation area and damaged the remains from the earlier stratum. A wall (W12), constructed from two rows of roughly hewn limestone with a core of small limestone and preserved two–three courses high, was built on top of Floor 13. 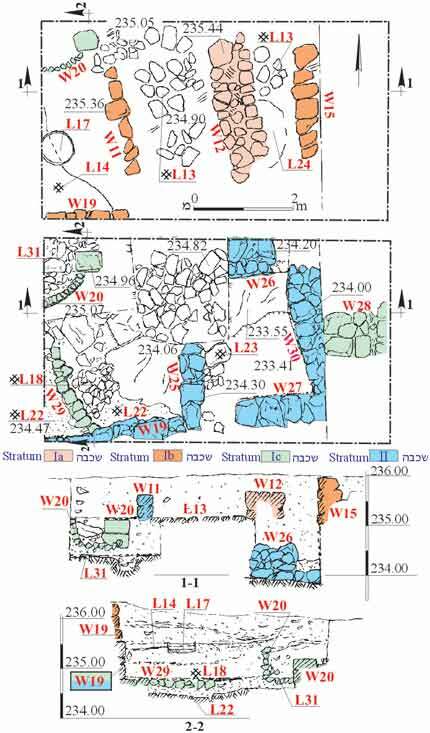 Wall 12 was not connected to the two walls of the room and its building method was different; therefore, it was ascribed to a third construction phase in Stratum I (Ia), although we were unable to date the wall with certainty and it may possibly postdate the Mamluk period.